This post first appeared over at Real Housemoms where I’m a contributor. This easy, rich, and chewy Chocolate Chip Cookie Cake is the perfect cake to make for your next birthday celebration! When I was in elementary school (long ago) cookie cakes were all the rage, especially for celebrating birthdays. Someone even once brought in a double layer cookie cake! Now that was insane. We were eating cookie cake so often that I almost got sick of it. 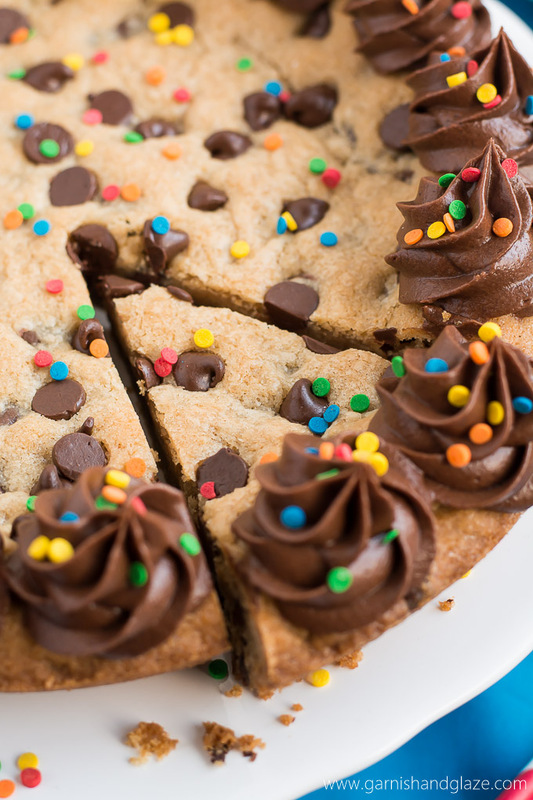 This Chocolate Chip Cookie Cake is so good though, I don’t think you or I will be anything but addicted to it! While I’m currently obsessed with these Bakery Style Chocolate Chip Cookies, I used the cookie dough recipe from my childhood that my mom made more times than I can count. The cookies are amazing and so is the dough! My mom was super cool and let my siblings and I eat spoonfuls of dough and she would even reserve some balls of dough to pack in our lunch. Talk about trading power at the lunch table! But I of course, would never give up something so delicious. Sometimes my mom would form the dough into cookies, but she would also spread all of the dough in a jelly roll pan, bake it, and cut it into bars. 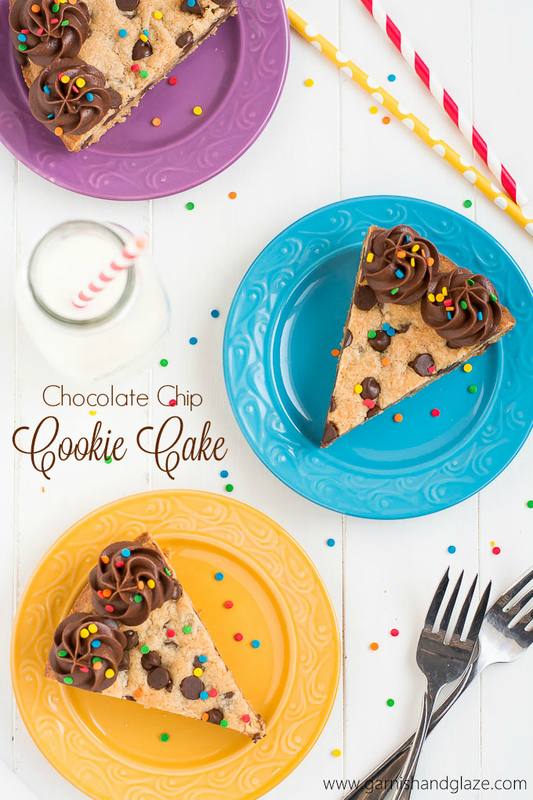 It’s so much faster and easier to make bars and they taste just as yummy if not better, especially if you enjoy the chewy center of a cookie… which is why this Chocolate Chip Cookie Cake is so amazing. Go whip up some cookie dough, eat a spoonful, spread the rest in a pie plate or cake pan and bake it. Once it’s cooled, transfer it to a platter, top it with some incredible chocolate frosting and colorful sprinkles, and slice it up. Oh, and then par-tay! Beat all the frosting ingredients together until smooth, adding milk as needed. Place into a piping bag fitted with a 1M tip. Pipe on frosting. Sprinkle on the sprinkles. I stumbled across your blog this morning when I needed to find a cookie cake recipe for my husband’s birthday. This recipe is PERFECT! The cake turned out so well and the frosting recipe was delicious. This will surely be a new go-to blog! Is there a certain. Type of butter to use like unsalted? Rachel, I always buy salted butter so that’s also always what I use in my baking. I made this cookie cake it turned out great. However do not combine the icing and sprinkles if you are putting the icing in a popping bag. The sprinkles clog up the piping bag. I had this problem which was a little frustrating. The cookie cake tastes great and I will definitely make this again. How long would you cook this if you doubled the recipe and used in a 12″ size cake pan? I haven’t tried it but I’d start checking to see if it’s done around 25 minutes and then cook longer if needed. Sorry I’m not more help. I don’t have a 12 inch round cake pan. I was wondering the same. I’m going to try lower cooking temperature for a longer period of time to ensure the center is cooked also. About how thick is the cake with the recipe you used? It’s about 1/2 inch in the middle and on the edges is 3/4 inch thick. 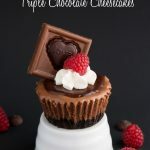 I’m thinking about making this for valentines day, but my boyfriend loves peanut butter chocolate chip. If I used half a cup of chocolate chips and half a cup of peanut butter chips. Do you think it would still taste ok. Never made a cookie cake before. Yes! I think that sounds delicious Stacey! My son’s birthday and he does NOT like cake. I found this today and immediately tried it. The recipe is AWESOME. I’VE NEVER BAKED A COOKIE CAKE BEFORE. This is now my go-to. Such a simple recipe. I divided the batter into 1 round silicone cake pan, and 1 pie pan (it’s what I had!) baked for 24 minutes – PERFECT. I lined both with parchment paper. I also used a second piece of parchment paper to flatten out the batter in each round pan The pie pan had the raised edges. EASIEST WAY TO BAKE A QUICK SLICED COOKIE! Thank you! I’m so glad you like it Ahlam! you have good taste in food. Could I supplement the brown and white sugar with coconut sugar? I’ve never baked with coconut sugar so I can’t recommend it. If you do try it, please come back and comment how it worked. This turned out delicious, although mine wasn’t nearly as pretty as yours. i loved your resipe i tasted so good that i want to eat it every day and every year forever. Haha! That’s an awesome review. So glad you enjoyed it Alondra! I loved this recipe! I made it for my little brother who turned ten. He usually doesn’t like chocolate, but he loved the frosting! Thank you so much for this recipe! Fiona, I’m so happy to hear that he loved it! What an awesome sister you are to make him a homemade cake! 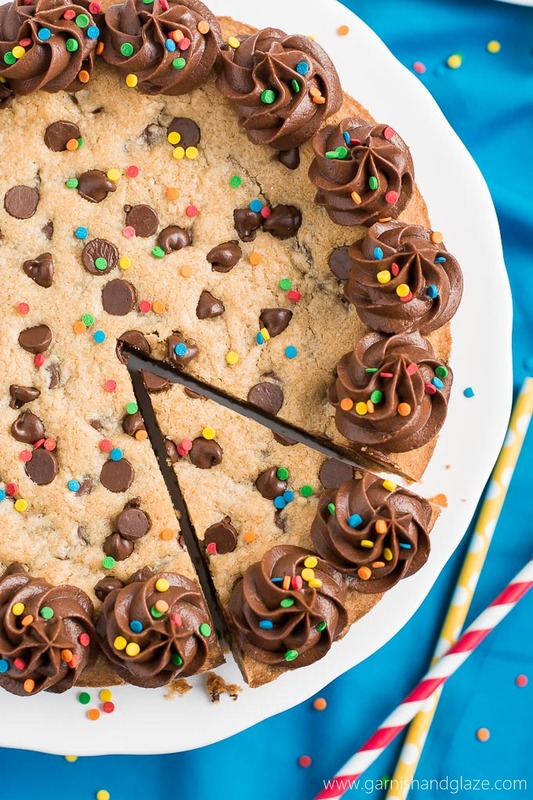 This cookie cake looks fabulous and I’m hoping to make it for my friend’s birthday. Just a quick question – if I bake it and prepare the whole cake on Monday night, will it still taste as good on Wednesday morning? Her birthday is on Wednesday and I won’t be able to bake it on Tuesday… is there anything I should do to help keep the cake tasting fresh for longer? Hi, do you think I could use margerine instead of butter so that my lactose intolerant friend can eat it? Usually lactose intolerant can handle butter in desserts but if they are that sensitive you can use margarine. Can this recipe be halved? It has a great taste but was wondering about making one not so thick. I don’t like it at all it’s way too crumbly and it doesn’t doesn’t have enough liquid in it so it does on mine together. Sara, I’m sorry this recipe didn’t work out for you. I’d love to help you find where things went wrong. Did you change any of the ingredients or cooking temp or time? The dough or cookie shouldn’t turn out crumbly at all. This recipe looks amazing, and I cannot wait to try it! I do have one question… did you use all-purpose flour? I don’t think that it is specified in the recipe. Thank you! And yes, all-purpose flour. What if you don’t have brown sugar? You can make your own brown sugar if you have granulated sugar and molasses. Its important to use brown sugar (or substitute) because it adds a depth of flavor and makes the cookie chewy. So, my daughter asked for a cookie cake for her birthday. I checked out Mrs. Fields and the cheapest cake option was $40! So I started looking into making my own and came across your recipe. Well, it was a hit! 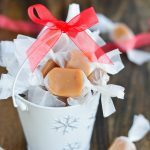 Easy to make, affordable, and the kids said it was better than Mrs. Fields! Thanks for making me look like a rockstar baker! If you use a large pizza pan it will be thinner and probably not need to cook as long. Yes! I just made this on a round pizza pan. Baked for 15 min. Turned out awesome! This was wonderful! I made this in a nonstick spring form pan, and lined the bottom with parchment paper. I used half semi-sweet chocolate, and half milk chocolate. We also chilled the dough. It was very moist. Thanks so much for the wonderful recipe! I will make this again! Great idea to use a spring form pan! So happy to hear you enjoyed it, Lauren! 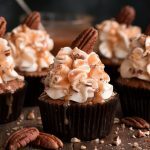 Hi, i’ve just come across this recipe and immediately knew it would be perfect for my best friend’s birthday! I need to make the cookie cake in a 2hr time slot- in my food technology lesson. I would love to be able to pipe on the frosting in these 2 hours! But, my only concern is wether It will cool quick enough for me to pipe the cookie cake. So, how long does it take for the cookie cake to cool? Sorry to bother you, but please could u reply ASAP! Sorry if I’m too late but you should be able to frost it on the edges. Just be sure to place the cake in a cool place away from the hot oven so it can cool as quick as possible. Okay, what did I do wrong? Baked for 30 minutes and still not done. Maybe it was the pie pan I used!? Did you use a pan smaller than 9 inch? Same with me : ( . Baked for 27 minutes & the whole thing still giggles. …. but I used crisco instead of butter 🤔 Bad idea apparently but that’s what I had on hand. But now idk what to do, the edges are becoming over cooked & the middle is definitely not close to being done. I’m 36 weeks prego & I just want a cookie cake 😭🤰🏼. Haha will try this again with regular butter though. Clearly the recipe has been a success for others so it was me and not the recipe. The same thing just happened to me:( I used a 9in pie dish and followed the recipe exactly I can’t figure out where it went wrong?? Made it for my daughter’s eighth birthday party. Came out perfect! Great recipe. Thank you! Interested in making this but due to time constraints would need to make the dough beforehand. Any tips on making the cookie dough two nights before hand? Can you use an electric mixer or should this be done by hand? please advise. Can’t wait to try it. 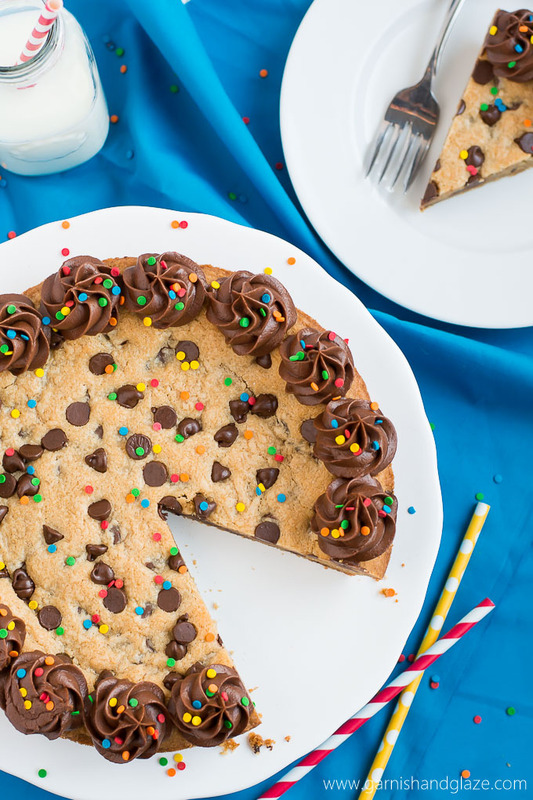 Is this cookie cake like an actual cookie or is it more like a cake? I make a cookie cake for my best friend’s birthday every year, but misplaced the recipe. She enjoys more of a gooey cookie cake, instead of a cake-like, fluffy cookie cake. Meaning is this more cookie-like or cake-like? I need it to be more cookie-like. any info would be greatly appreciated! Thanks you! Jamie, It is cookie-like. It’s really just cookie dough pressed into a pie dish to form one giant cookie. She’ll love it! Awesome recipe. Everyone loved it! Will definitely make again. Now to go check out your other recipes! Yay! I’m so happy you loved it Jenni! This recipe is fantastic!! I doubled it and put it in a parchment lined half sheet pan. Baked for 25 mins and it was perfect. Will definitely use again, thank you so much for sharing! So glad you enjoyed it Jen! I love cooking it that way and just cutting it up into bars. This recipe was so easy and it turned out exactly like the picture. I used the springform pan as well and it turned out perfect! IT was delicious and I will definitely be making it again! Thank you for sharing! Yay! Glad it was a success for you Wendy! And awesome idea to use a springform pan. I’ll have to try that next time. This was amazing! I made it for my 12 tear old daughter who loved it. Also, could I use this dough to make cookies? Awesome! So glad it was a hit. And yes! For cookies just bake at 350 for about 12 minutes. Hi there, could you please tell me what tip you used to pipe on the frosting? I just made this and it tastes so good! Thank you for the wonderful recipe! The cake tastes awesome, but it is a bit dry and crumbly. What did I do wrong? I followed the recipe to the T! Could you please help out on it… Urgent!!!!! Made this for my dad’s birthday tonight and we all agreed that it was the best cookie cake! The icing was delish too! Keeping this one to make again and again 🙂 Thank you! Made this tonight, absolutely delicious. It is however not like grocery store cookie cakes which is what I was after. This recipe tasted like a soft giant regular cookie. Any clue how they make the grocery store ones? ummmmmm… I hope you didn’t cook a person into your cookie cake. Hahahaha…. and all I was looking for was how far this cookie cake can be made and decorated in advance – is the night before ok? Stored on the counter or in the fridge. You could make it a couple days in advance and just store on the counter covered with plastic wrap. This smells amazing! I cannot wait to eat this tomorrow night! Made this for my daughters 10th birthday, she is excited too! How would you store? I keep cookoes on the counter, would refrigerator be better? I just keep mine on the counter covered. After we cut into it I put in an air tight container. For some reason this did not turn out right. Too salty and was too much like batter and not cookie dough. I followed directions specifically and went back over them to see if I misses anything. Not sure what went wrong. Sorry you’re having a hard time with this recipe Bethany. I’m not sure where you went wrong. Maybe you put in too much butter? Not sure how your dough would be thin like batter. Wow!! We are home on a sick AND snow day and I decided to make something and found this recipe. We didn’t have enough brown sugar so I very-sketchily reduced everything a bit. I don’t recommend that of course, but it still turned out amazing somehow! And that icing… OMG. I am not a chocolate icing fan but figured the kids would like it… wow, it was the best icing I’ve ever had. Totally sold me. I’m never buying a cookie cake again, this was super easy and DELICIOUS! Any tips for a writing icing if I make this for an occasion in the future, Would this icing write well or do you use something else? Hey Kelly! I’m so happy to hear how much you loved this recipe! For a white icing to pipe with, I like the one I spread on these sugar cookies. DIVINE! Doubled recipe and used 1c. of semi sweet chips, with 1/2 c. each of white and milk chocolate chips. Pressed into a 12×12 heart shaped pan. 1 inch thick in the center and 1.25inches around edges. Best birthday surprise for my 11 year old. Thank you! Made this for Valentine’s day with my husband and two kids. It came out amazing! It was very easy to make and we all love it!! Thank you!! This was my first making a cookie cake and everybody went crazy over it! I made it into a heart shaped pan for my boyfriend for Valentine’s Day and he absolutely adored it. Thank you! I made this for my daughters birthday party and the kids loved it! I doubled the batch, spread it (almost) evenly over a 1/2 sheet pan. It took 25 min to bake @ 350. Came out about 1/2 inch thick through the center and about 3/4 inch around the edge. Still soft, chewy, and chocolaty. Very delicious! Hi, when baking this, should a cake tester come out clean when it’s baked, like with a Victoria sponge?? 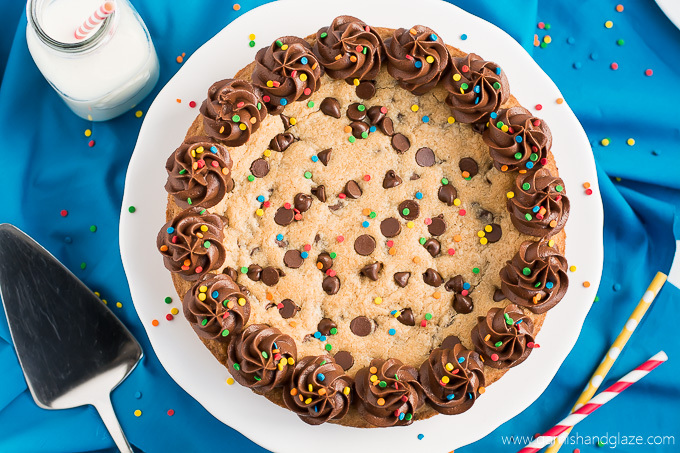 The perfect cookie cake! I made this last week after googling for a cookie cake recipe at my daughters request for that as her Birthday cake. She told me it was better than the Great American cookie cakes! And today is my youngest daughters birthday and she also has requested it. So delicious and moist and chewy! Exactly how we all love our chocolate chip cookies. Hi! I was curious whether this cookie cake was more dense or not? I like my cookie cakes more on the cookie – dense/chewy side than cakey side. My 11 year old daughter and I made this cookie cake! I could not believe how easy it was! We will definitely keep this recipe and make over and over! Thank you! Can this be made without eggs ? Omg! This went down so well!! I made it for my son’s birthday cake, I did two and sandwiched them together with the icing between them. I had so many comments about it. I cooked it for 22 mins as it started to golden, then took it out – it did sink a bit but was nice and gooey like proper cookie dough. I’ll be using this recipe again for certain!! I got busy and didn’t do a trial run before my twins’ 2nd Cookie monster-themed bday party and just prayed this would turn out edible… um, it was absolutely AMAZING. I pushed this into an 11 inch tart pan and baked for 22 min, and it came out beautifully brown on top and perfectly chewy on the inside. My only regret is that I had to frost a blue cookie monster face on it cuz no self-respecting adult enjoys blue frosting teeth! 🙂 Next time, I hope to use your frosting recipe. Beautiful! Melanie (also my name so you must be cool! )… you MADE the party! Thank you! This will be a regular in the rotation. I used this recipe for a bake off with my friends and I beat them by a landslide. I loved this recipe so much. This recipe is amazing, and extremely easy to follow! I made this for my boyfriend’s birthday, and he absolutely loved it! Thank you for this! I would like to try to make this for my sons 3rds birthday , he specifically asked for a chocolate chip cookie cake. He has an egg allergy though do you know if I could use an egg substitute? I’ve made this multiple times for parties and potlucks, and it gets devoured every time! Easy and delicious recipe. Thank you! Easy and delicious! It turned out perfect; thank you! I have found I prefer almond extract to vanilla in most chocolate recipes. I highly recommend it. It worked beautifully for both the cookie and frosting. Hi! I am planning to bake this for my boyfriend and was just wondering if putting Mn’Ms in it would ruin the recipe? Thank you for this recipe! This was a hit for my boys’ birthdays! I made a double layer cookie cake and put mint chocolate frosting in between one of the cookie cakes and the other one with half vanilla and half chocolate frosting. These have now been requested every year! Made this tonight. It took a few extra minutes to bake to fully cook the middle (could have been my oven), turned out perfect! I used sea salt and extra vanilla to give a sweet/salty contrast, and used some white chocolate chips along with ~3/4 cup semi sweet. Your recipe gives great American cookie a run for its money! Love this recipe! Do you have this recipe for a 14″ pan? Hi I’m not sure of the measurements when you say 2/3 cups , I use ounces and grams. I did buy cup measurements but do you mean two thirds or 2 to 2 cups??? 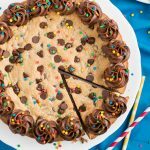 This Cookie Cake recipe is a real winner! I made the recipe in a 8 inch pan and the cookie was so thick, soft, & everyone loved it! It’s definitely a new family favorite for celebrations!! In the future for larger events I may try to double this recipe and make it in a 14 inch pan….with a little extra to spare! Thanks for sharing Melanie!!!! My daughter has an egg allergy. Any suggestions on what I can sub out for egg in the recipe? my daughter wants me to make sure the cookie cake is more gooyie than a hard cookie, thoughts? This same thing happened to me. I used a 9″ pie pan, and it spilled over at least half a cup’s worth of dough, directly onto my oven’s heating element of course, and my entire first floor is FILLED with smoke. I left it in for four more minutes (26 total) and the entire she’s are slightly burnt and the middle jiggles like Jell-O. I think you should at least put a disclaimer in the recipe that says several people had this same problem. Very disappointed. Nothing short of amazing! It turned out great! I’ve made this several times and it’s an amazing recipe. Thank you for sharing! Omg! I was so questioning how this was going to be. I’m not a baker, and never good at making this sort of things. This is the best easiest, yummiest delicious cookie Ive ever had! The kids were blown away just like I was! This is not a new family favorite, and I don’t think this will wait till birthdays anymore!!! Thank you thank you for sharing your delicious creation!!!! ***** 5 start! Is this recipe NUT FREE? Hi! I almost forgot my 16yr old son wanted a cookie cake for his birthday! I googled and came across your reciepe and it saved the day! I actually found a small 12″ pizza pan at the dollar store and used parchment paper on the bottom to help transfer for decorating and on the top to flatten out the dough with a rolling pin and cooked it for 22 mins at 350. It worked perfectly. Taste testing will be later tonight with all 4 kids. (Just goes go show great cake for ALL ages) Thanks so much! I made this for my sons birthday. He loved it. But I did change a couple of things. I made it in a 16 inch pizza pan and doubled the recipe baked it at 325 degrees for 25 minutes. this one will be printed and go in my permanent recipe book. I made this for my son’s 13th birthday because he wanted a ‘cookie cake’ and I knew I could make something better than a mall cookie. I was right! He loved it and wants it every year now. FWIW, I also had good success with a springform pan. I am new to baking and want to try this for my kid’s birthday party this Saturday. Why use all purpose flour, salt and baking soda…why not use the self rising flour instead? Sorry for the amateur question. Thanks I ended up following the recipe as stated and it turned out good. The edges got a little bit crispy but I think that’s because I used a pie plan. It was awesome. I am so happy to hear it’s your go-to! 🙂 The addition of peanut butter m&m’s sounds amazing! You don’t need to change any thing else in the recipe. Just swap out all the chocolate chips or just some. Let me know how it is! Hi! I am 8 years old and I followed your recipe to make this delicious cake for my school baking competition. I did a practice run of it before the competition and I made it again the night before the competition. I shared it with my family and they all loved it so much that we couldn’t stop eating. For the competition, I named the cake, “My Chocolatey Chocolate Chip Cookie Cake Craze.” Even though I didn’t win the competition, I was really proud that I got to make this cake with my mom. So, I just tried this. Tip…. DO NOT double the recipe and bake in a large cookie sheet. Use a cake pan! It overflowed from my cookie sheet. Also it is taking longer than expected to finish. Melanie, , what a gorgeous cake! Your directions make this seem like such an easy approach, too. I would love to make this soon! Melanie, bravo! What a great idea! Love this. I’m sure this is incredibly delicious! Do you use semi sweet or chocolate chips? I always use semi sweet but feel free to use what you prefer. Melanie, thanks! Made this last night so quick, easy and tasty! Melanie, it looks so yummy! I love the step-by-step instructions, making it an easy recipe to follow!